Railroad ties are often discarded after repair work on railroads, which gives you a prime resource for making your own outdoor steps. The railroad ties are robust and weather-proof despite a lifetime of structural use and will make a great addition to your lawn or garden. Some care will have to be take to properly seat the ties, as just placing them in the ground can lead to significant drift when dirt is eroded by the weather. Measure the distance that your want to terrace with steps. You will need three or four ties per vertical foot, depending upon how steep you want the stairs to be. Use a pencil and a pad of paper to record the different stairway measurements if your are placing steps at different points along a path and not placing steps the entire way. Place a railroad tie down on a piece of cardboard and trace an outline. Cut this out and use it as a template to visualize how you will place the railroad ties. Place this template down on the ground where you think you want a tie. If you're satisfied, then spray paint around the edges to put the template image on the ground. Place the template perpendicular along the side of the stairs to form a retaining barrier. 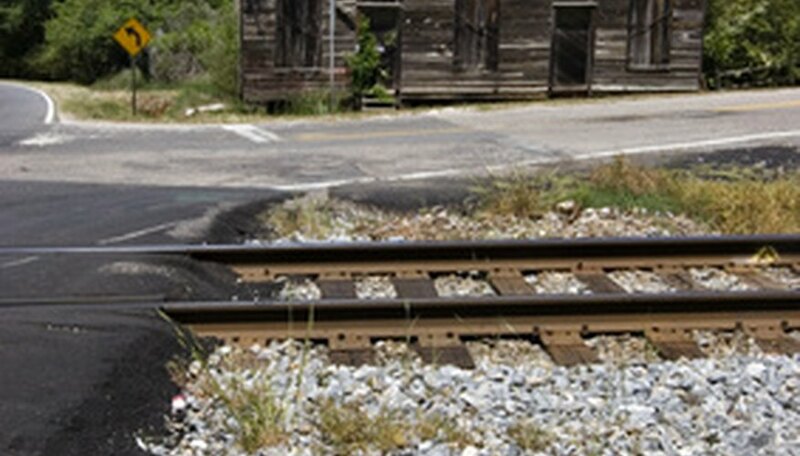 This is to prevent the railroad ties from shifting over time due to rain and heat. Spray paint this template down as well. This is not a mandatory step but it is highly recommended. Dig down inside the template outlines you sprayed down. Have a railroad tie handy to fit in until you have achieved the depth you want for the steps.The steps should be visible both on the front and top so that people can see that there is a step there. The perpendicular reinforcing ties can completely buried as their function is purely supportive, though they can be left exposed for decoration. Pour gravel down into the trenches before you put in the railroad tie. The gravel will help stabilize the tie. The gravel will move less than dirt, thus preventing drift over time.